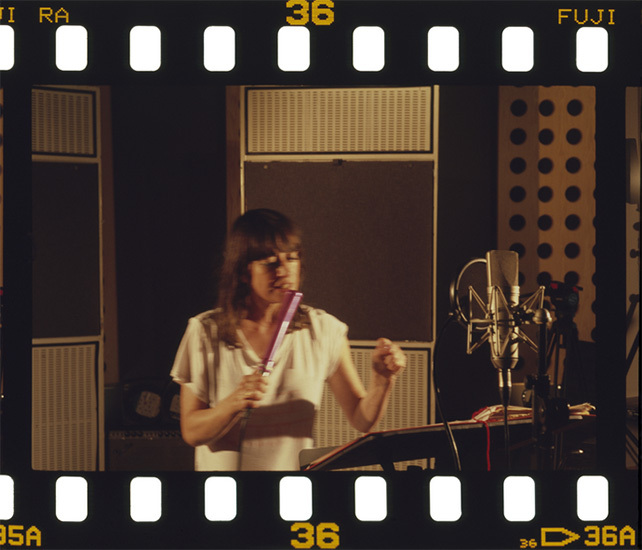 The film begins with Tompkins performing at Chem19 Recording Studio. The camera films from a multitude of perspectives, employing rhythmic pans, tilts, and opaque or reflective screens. These distorted views, combined with non-synchronised images of the performer, depart from a 70s “direct cinema” approach to filming musicians. After the ritualistic opening section, the film widens its view to locations outside of the studio. The repetition of actions (picking books from a shelf, re-arranging the contents of a fridge) suggest a searching for a threshold between the filmed image and Tompkins’ own spoken word acts. Taking cues from the performers’ hypnotic yet concrete play with words, the film creates a metaphoric, symbiotic language, where an open-ended approach to montage transcends both reductive imagery and straight documentation. Luke Fowler (United Kingdom) is an artist, filmmaker and musician based in Glasgow. His work explores the limits and conventions of biographical and documentary filmmaking, and has often been compared to the British Free Cinema of the 1950s. Working with archival footage, photography and sound, Fowler’s filmic montages create portraits of intriguing, counter cultural figures, including Scottish psychiatrist R. D. Laing and English composer Cornelius Cardew.